With this post, I commence a new series on the Deft Digits blog: Discover a Guitarist. Each post in the series (inspired by John Horne’s great article, 70 Guitarists You Really Should Know About) will profile one prominent player from anywhere in the guitar’s history. I’ll discuss how I discovered the player, how you can discover him or her for yourself, and the impact on my own musical life. I begin with my all-time favorite guitarist, Stevie Ray Vaughan. 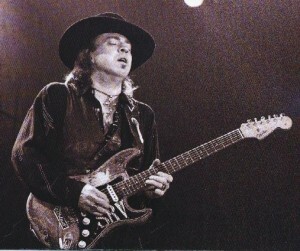 Stevie Ray Vaughan (1954 – 1990) was the leading blues rock guitarist of the 1980s. The first time I heard him was in late 1998. I was 15, and I’d been playing for less than a year. Most of my own playing revolved around the likes of The Offspring, Foo Fighters, and Smashing Pumpkins at the time. I hadn’t heard much blues music, but The Blues Brothers was one of my favorite movies, so the soundtrack had primed my ears for this moment. I was at an all-weekend swim meet in Federal Way, WA with my dad, spending the night in our RV in the parking lot. He happened to have Stevie’s Texas Flood with him, and he put it on the stereo. I was completely floored. I had never heard a guitar played so ferociously. It was one of those rare life-changing listening experiences when you already know in the moment that you’re going to remember it forever. My dad already owned three of Stevie’s albums, and in the following months I couldn’t get enough and bought the remainder of his discography. For a while, I had no interest in listening to anything else. Nothing satisfied my ears like Stevie, and I spent every spare moment listening to his albums over and over. With his Fender Stratocaster tuned down a semitone, heavy gauge strings, minimal effects, and two amplifiers, Vaughan was able to wring a plangent, full sound from the instrument. His bristling, rhythmic fills have a contrasting, almost acoustic-sounding presence. But nothing says it better than hearing and seeing for yourself. This is one of Stevie’s best moments, from my favorite DVD in my entire collection: Live at the El Mocambo. While I don’t own every last item in the SRV catalog, I can safely recommend them all; I’ve never been disappointed. Here are a few of my favorites. For more quick info, see YouTube and Wikipedia. As soon as I heard that first album, I wanted to learn to play like that myself. I started bringing recordings to my guitar teacher to see what he could show me. He taught me how to play “Pride and Joy”, “Mary Had a Little Lamb”, “Little Wing”, “The Sky Is Crying”, “Lenny”, “Say What”, and “Empty Arms”. This was the perfect vehicle for a teenager learning the blues, and I dove right in. I started searching backwards, reading about Stevie’s influences and checking out Jimi Hendrix, Albert King, Freddie King, Albert Collins, and Buddy Guy. All of this did wonders for my technique, and within my first three years of playing guitar, I had the proficiency to tackle most blues and rock music I could get my hands on. In the long run, Stevie’s playing affected my ears as much as my hands. Taking all that time to study and learn his guitar parts really clued me in to the standard 12-bar blues progression and kick-started my endeavors in improvisation. It also set an expectation for intensity, both in my own playing and what I love to listen to, popping up later as I set out to study jazz. Most important, Stevie is an inspiration. He gave his life to music, not as a sacrifice, but because he was so forcefully drawn to it. He had a fire in him, a boundless curiosity, and rather than temper it, he fanned the flames and took his music as far as it would go. Already a fan? Leave a comment below and tell us how you discovered Stevie’s playing and what it’s done to you.